Tailor-made travel and custom departures to fit your schedule are available on a year-round basis. 10:00 a.m. Meet at the designated hotel in Florence. After introductions your guide takes you on a walking tour through the streets of Florence for a truly local experience. Our guide Michelangelo will show you the highlights of the city and where he and his ancestors were born. Get an insider’s view of areas known only to locals. You will be immersed in and abundance of art and architecture as you walk through the stre ets of Florence, a living outdoor museum. Sites include Palazza Vecchio, the Duomo, Ponte Vecchio, Piazza della Signoria, and the Marsili tower. After a light lunch together you have a free afternoon to walk around on your own, visit museums, stop at the San Lorenzo market, or take in some truly Italian shopping. A guided tour of the Ufizzi Gallery is available and priced upon request. This evening you meet your guide for a welcome dinner. Start your day early with a buffet breakfast. Your guide picks you up at 9:00 a.m. and whisks you out of the city for a visit to San Gimigano, a town renowned for medieval skyscrapers, towers, and beautiful squares. The main square is filled with lovely trattorias and leather shops and the streets are lined with ceramic ships. Lunch is on your own before heading back to Florence. We suggest a very light lunch so that you leave room for dinner! 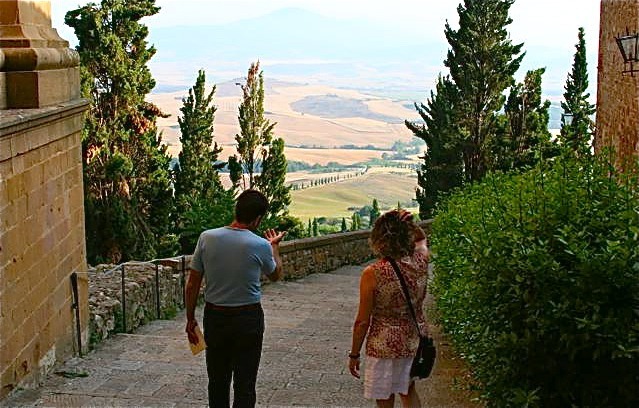 Our guide is happy to take you on a walk of local Tuscan trails to ready yourselves for a fulfilling dinner. 2:00 p.m. Leave San Gimignano for the Villa Il Paradisino, where you will cook a meal of a lifetime. The class begins with a tour of the gardens and an introduction to organic farming. Next, enter the main villa, Chef Costanza’s family home since the eighteenth century. The exquisite large kitchen has been modified so that everyone can participate in cooking the 5-course meal using Florentine family recipes. Once you have finished cooking your first true Tuscan meal, you are sent out to the garden to clear your mind and senses of all kitchen smells. According to Chef Costanzna, “Our palate for tasting is heightened when we start by clearing our senses of all kitchen smells, no matter how tantalizing they are.” While you relax, an elegant table is being set for you inside where you will dine like royalty. Dinner is based on seasonal produce. 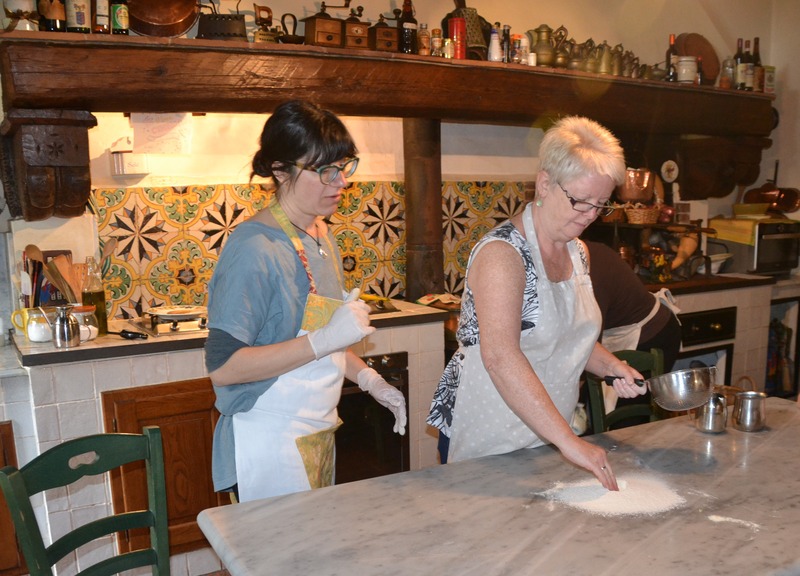 Each cooking class includes 1 appetizer, 1 first course, a second course with 2 side dishes (called contorni), and 1 dessert. Included beverages are 1 glass of prosecco, ½ bottle of wine per person, and coffee. Villa Il Paradisino’s mission is to make sure that you return home with the knowledge of how to prepare meals with Tuscan flavor and culture. Dream it and we will make it happen! After breakfast you are whisked to the Tuscany countryside. Enjoy a short walk around the UNESCO town of San Quirico followed by the quintessential town of Montalcino, renowned the world over for wines such as Rosso and Brunello di Montalcino. We leave the peaceful town of San Quirico for the lively Gothic dream city – Siena. The Duomo is famous for colored bands of marble dating from the twelfth century and for stunning interiors. The Hospital of Santa Maria alla Scala with the recently opened Room of the Pilgrims showcases frescoes of the 1400s. The Piazza del Campo is a not-to-be-missed stop. Twice a year this is the location for the Palio horse races from the James Bond film Quantum of Solace. The walk: 14 kms./9miles; shorter options available. 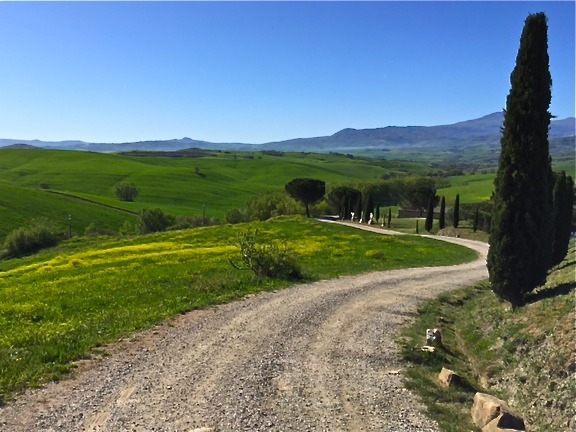 Visit the town of Pienza and walk in the picture-perfect Tuscan trails, followed by an even more perfect farm lunch at a family-owned organic farm. This afternoon their is time to relax in the hotel garden, take advantage of the spa, or do some local shopping. Dinner on your own tonight. Our guide will be happy to help you choose the perfect spot. Transfer from San Quirico to Cortona for a guided walk around and into the historic city center and visit the town museum for an understanding of Etruscan life. Lunch is on your own today at one of the many trattorias in the town. Visit local shops and special spots that were used in the filming of “Under the Tuscan Sun.” We recommend a visit to the Cortona theatre. At 2:30 p.m., the group reconvenes and proceeds by private transport to the plains below Cortona where you visit large tumuli – Etruscan family graves. Guests are welcome to participate in the entire excursion, or opt for the morning only. Dinner is on your own in the lovely town of Cortona. A transfer to and from Cortona is provided. There are two options available today. Option I: Included in pricing is a guided tour of Montepulciano, a miniature Florence famous for its Vino Nobile. There will be a wine tasting stop at Contucci, one of the oldest wineries in the region. Option II: We can organize a guided cycling tour of the region. Please note that there is an extra charge for cycling tours. Whichever option you choose, we will get you back to the hotel with ample time to relax and freshen up before our farewell dinner hosted by Ruth and her family, owners of Villa di Piazzano (B, wine tasting, D). All wonderful things must come to an end. After breakfast we say our goodbyes to this amazing adventure. Whether you are returning home or continuing on to other parts of Italy, our concierge service is happy to help you get to your next destination (B). Included: Accommodations as listed, hotel taxes, hotel gratuities, all breakfasts, 2 lunches, 3 dinners, 2 wine tastings, all transfers as listed, full-time guide or host, guided walks on Tuscan trails. Not included: Airfares, airport taxes, travel insurance (mandatory), pre- and post-trip arrangements, personal purchases, mini-bar services, alcohol unless specifically included, gratuities for guides and drivers. *Note: There is a supplemental charge for those who want to bike instead of walk-hike. All bookings through Voyages GAM-SPS Travel Inc. Quebec Licensee. * We can customize any of our walking trips to begin on a date that is convenient to you. Supplemental charges may apply. Group trips are offered in English.